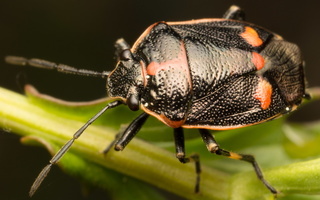 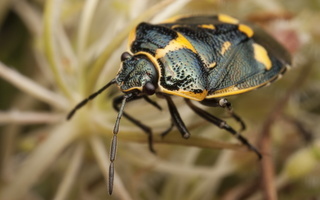 EN: Crucifer Shieldbug also known as Cabbage or Brassica Bugs 5-7 mm. 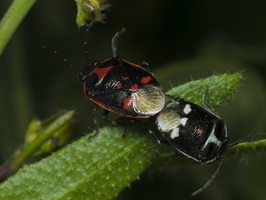 Occurring in two colour forms, red and white for both males and females. 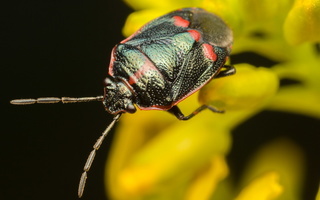 These forms are seen as appropriately coloured dorsal spots with the red form being rarer than the white. 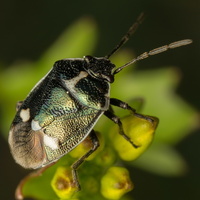 Their eggs are barrel shaped and yellow green usually number about 55-80 incubated for about fiveteen days, nymphs and first instars are black with succeeding instars gaining the coloured spots becoming clearer with older instars (five instars in all). 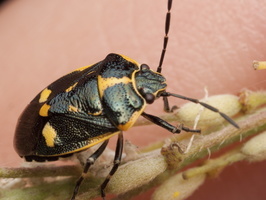 Host plants are Cruciferae (cabbages). 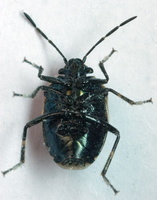 There are usually two generations a year, adults hibernating over winter in cracks or crevices in the soil and on trees. 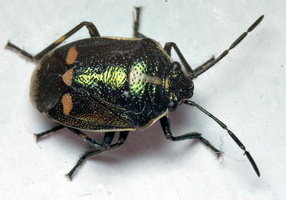 Male are larger than the female.